They aren't quite an 'all-star' band, however the members of MAGSTATIC have quite the pedigree, most notably vocalist/guitarist/frontman Terrance D.H., who crooned for Salt Lake City's most iconic punk outfit THE STENCH as well as the immortal BAD YODELERS and others. His silken voice has always been able to capture my imagination and emotions. His esoteric lyrical wisdom is second to none, and in an exploding emo scene that is no small statement. He has a unique twist on everyday emotional ups and downs that he develops through a lyrical discourse that demands individual interpretation. On the MAGSTATIC mcd he has some of his finest moments. My favorite being his metaphor of being the world's worst race car driver in the race of life on 'Directions'. 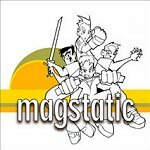 Musically MAGSTATIC incorporates a variety of vibes. Obviously emo plays a big role in their approach, but their sound is so much more that it would be felonious to try and pigeonhole them. The band is fleshed out with Spencer Jacobs on guitar (formerly of sXe pounders REALITY and the quasi-emo MAYBERRY), and the rock solid rhythm section of Pete Lindgren on bass and Joe Patterson on drums. The CD kicks off in fine form with 'Home,' a song that is rife with pop sensibilities and scotch smooth melody. It's not really 'power pop' in the traditional sense but it is definitely powerful pop. The second tune is the afore mentioned 'Directions' and is a gentle flowing piece of ethereal emo with an instrumental outro called 'Misdirection'. 'Dime Rolls' is an energetic rocker with a sharply barbed hook, reminiscent of THE STENCH's later output I must say. 'Dynamite' is revived from the previous demo and is a dreamy ballad. The CD wraps up with 'Fire' another lively number with more punch than any of the other tunes and one of my favorites. I may never recommend an emo band as highly as I do MAGSTATIC and this mcd is as essential piece of the puzzle. It also dwarfs their Sub Pop 7" in class and magnitude.